The concept development phase of an automotive ‘body-in-white’ structure is characterised by the availability of design freedom to experiment with different packaging, manufacturing and structural strategies. This rapid exploration of different ideas helps to inject innovation into the platform design. 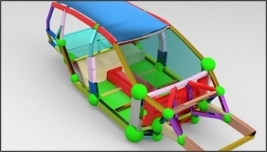 However, traditional simulation (CAE) often isn’t quick enough to deliver the required design direction. To meet this challenge, Altair has developed a unique three stage concept development process, C123. Every stage deploys optimization technology, providing the designer with structural data relating to the mass and attribute performance consequences of various design decisions and facilitating target ‘trade-offs’. 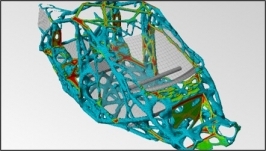 Throughout the process, the sophistication of simulation technology is matched against the maturity of the available design data in order to ensure simulation is a collaborative partner in the design process. C123 is independent of vehicle architectures (e.g. 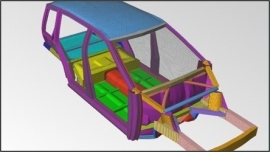 monocoque, body-on-frame, tub and spaceframe etc. ), manufacture process (e.g. extrusions, sheet metal, casings etc. ), material selection (e.g. metals, composites, mixed etc.) and platform sharing strategy. The process is supported by a bespoke toolbox built off Altair HyperWorks. It has strong interoperability with CAD to ensure optimised structural architectures can be efficiently incorporated into the design environment. Take just a few minutes to learn more about C123 by listening to the answers to key questions from leading practitioners Dr. Royston Jones and Dr. Stuart Bates. Find out more about C123, in this more in-depth, 20 minute overview presented by Dr. Royston Jones. Royston discusses the process in detail, describing how a design is moved forwards through each stage. If you have a question about C123 or would like to discuss the process further, please complete the form below and we'll contact you.